On dark, stormy nights ghostly screams can be heard and there have been reports of a ghostly horseman, accompanied by a woman, spotted at the foot of the walls by the river. Strong smells of freshly baked bread. 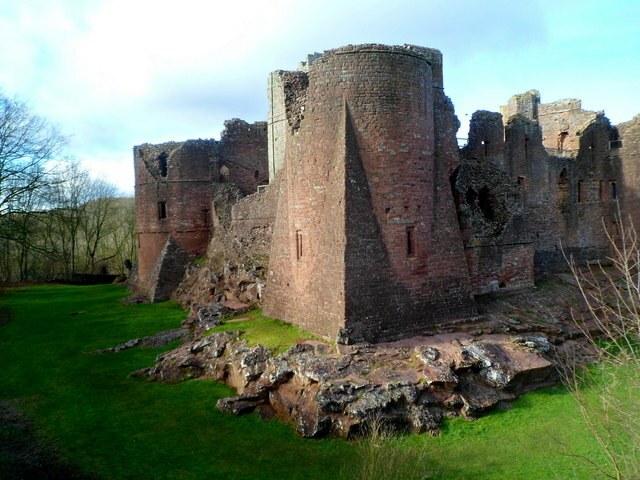 Goodrich Castle in Herefordshire has a well known haunting relating to the tragic tale of two lovers. During the Civil War, Goodrich saw major action when in 1646 Colonel Birch, leader of the Roundheads, placed the Royalist garrison under siege. His niece, Alice, was engaged to one of the Royalists inside the castle. One night, just before the final assault, Colonel Birch allowed them to escape but in their frantic attempts to clear the enemy lines and cross the River Wye they missed the ford, they were swept away by the river and drowned.